We are very happy with the flat – design, build etc. Although there has been a few minor issues with fixtures & fittings. However, L&Q who own the building have been very difficult to deal with and at times unprofessional. The lift in the building is consistently broken, often for weeks at a time. Great location that over time will improve. A varietybof transport links available and only a short trip to central London. The poor reputation that L&Q have. The Residence forms part of an exciting transformation of London’s South Bank into a thriving residential and business district. With many new local amenities promised, it only takes a small imagination to envisage a new micro community full of grocery, retail and restaurant options of any taste. The Residence by Bellway Homes forms part of the same dream, offering reasonably priced apartments that are for the moment long term investments but in the next few years become homes for families and professionals alike. The interior common areas are also finished to a glossy standard which are reminiscent of the infamous Manhattan high rises. The residents amenities are all located in Haines House, which include a reasonably sized gym, media lounge and conference room. They are spacious enough but perhaps explain how the service fee (around GBP4.00/sq.ft) is kept so low compared to other local developments.. You do have the choice between three colour schemes (light, medium and dark) to personalise your apartment which is particularly redeeming, as well as the opportunity to upgrade the built in appliances to more high end brands (Siemens to Miele) which also have a 2 year build warranty. Green space is rather scarce at the moment but the plans for the expansive Nine Elms Park promise to bring nature closer to the area and should arrive by 2025. Within the development, small patches of landscaped gardens have been created above the parking lots to resolve the issue for the time being. There is some disparity between views across the buildings. The pricey NW facing apartments in Glacier House and Haines House look directly only a Royal Mail depot that is in constant use. The plot occupied by Royal Mail is also for sale and finds itself in the middle of a bidding war to become another high rise building. 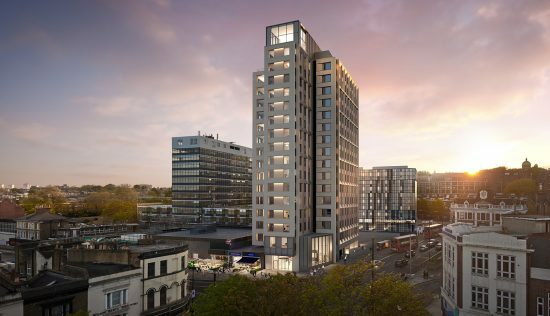 The S/SE facing apartments in the main block also face directly onto the Madeira Tower, which will be the final building to be completed, meaning that a direct view of construction will have to be borne out for even longer. At a very reasonable price point, The Residence offers an opportunity to buy an apartment that must be a good investment in a hugely up and coming area. Prices starting at just GBP615k for a one bed is in stark contrast to just over the river. However, the area is facing considerably many more years of construction and all that that comes with, however this is surely one ofr the future. 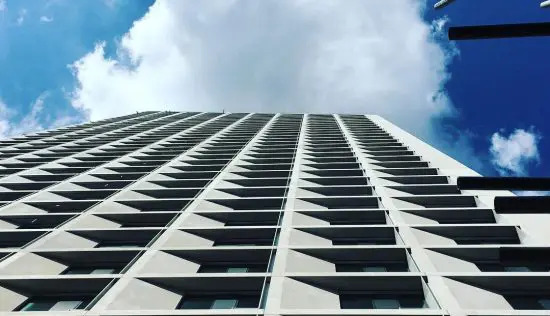 The external cladding is vibrant and cheerful and the interior design of the apartments is done to a surprisingly high standard for the price; especially as you have a choice of 3 colour palettes and can upgrade from Standard to Luxe fittings. 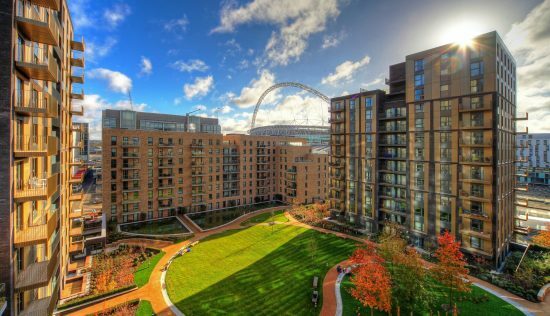 Set amongst the mass gentrification of the Nine Elms neighbourhood is The Residence, a luxurious development of one, two and three bedroom apartments with views over the Thames. 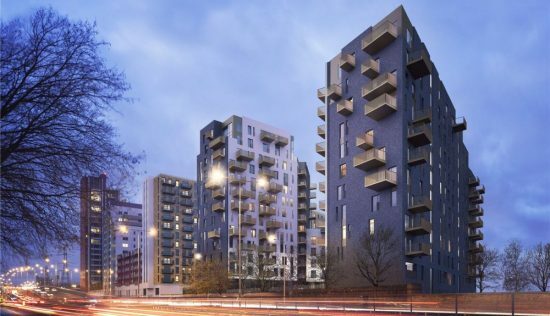 Developed by Bellway Homes and designed by GRID Architects, it joins a contingent of new homes and souring towers on the South Bank that will benefit hugely from the extension of the Northern line to include Nine Elms and Battersea Power Station Tube stations. 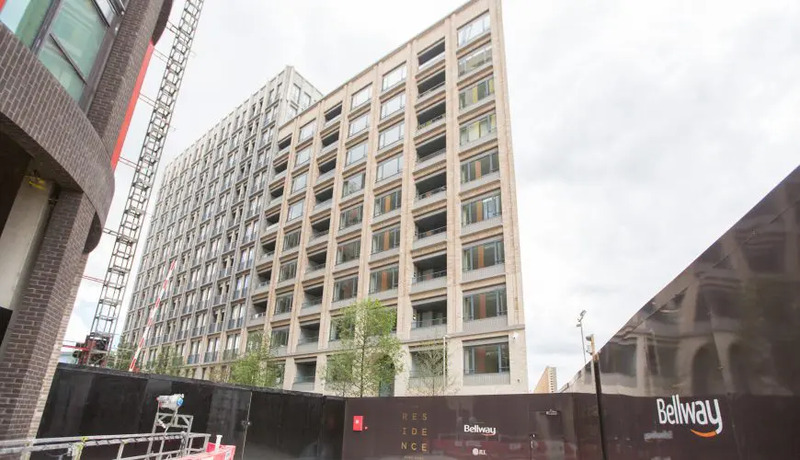 The Residence itself will be just minutes from Nine Elms station when it opens in 2020 journey times from here to the City will be just 12 minutes, and youll be able to reach Westminster in around eight minutes. Currently the nearest Underground station is Vauxhall (Victoria line), which also connects with Victoria and Waterloo mainline stations, and the south of England. Whats more, a proposed cycle and footbridge over the Thames will connect this area with Pimlico, close to Victoria mainline station. The Nine Elms area is or will be, once all the construction is complete full of restaurants, pavement cafes, galleries and hotels, drawing daily visitors as well as new buyers. There are plenty of shops and markets, including the largest fruit, vegetable and flower market in the UK, New Covent Garden Market. And once the Battersea Power Station complex is fully up and running to the public, it will provide an enviable range of leisure activities and places to relax with friends during the evenings and weekends. Families will also be attracted to a selection of well regarded schools near the development, two of which are new additions to the district. With the development itself, residents can enjoy amenities such as an on site gym, cinema room, private function room and a 24 hour concierge service. And when the weather behaves, they can also make use of a private residents garden and roof terrace. The exterior of The Residence is slightly commercial in appearance, but not offensive in nature a boxy brick faÃ§ade is interspersed with streaks of colour visible from an angle. Inside, the apartments are very much a greige blank canvas where owners can make their mark and personalise them as they see fit. Open plan kitchens feature Silestone worktops, soft close units and integrated appliances, while the bathrooms include Porcelanosa tiles, Vado brassware and white sanitaryware. Meanwhile, in the bedrooms youll find fitted wardrobes with interior sensor lighting and engineered walnut flooring. There are balconies in all apartments, providing that all important private outside space. Double glazing will also help keep the living spaces noise free from the adjacent railway lines. 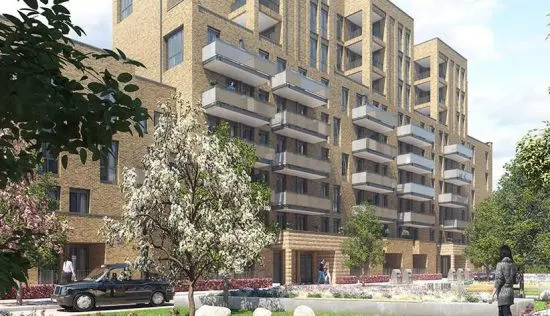 The average price per square foot for SW8 is currently GBP1,608, and the fact that The Residence clocks in at around GBP1,097 makes it an appealing option for buyers looking to tap into this new and exciting community. Other developments to consider are Embassy Gardens and One Nine Elms.